Label-Aire 3015-ND was designed for simple wipe-on labeling applications in all markets (available in either 220 Volts, 50 Hz or 115 Volts, 60 Hz configurations). 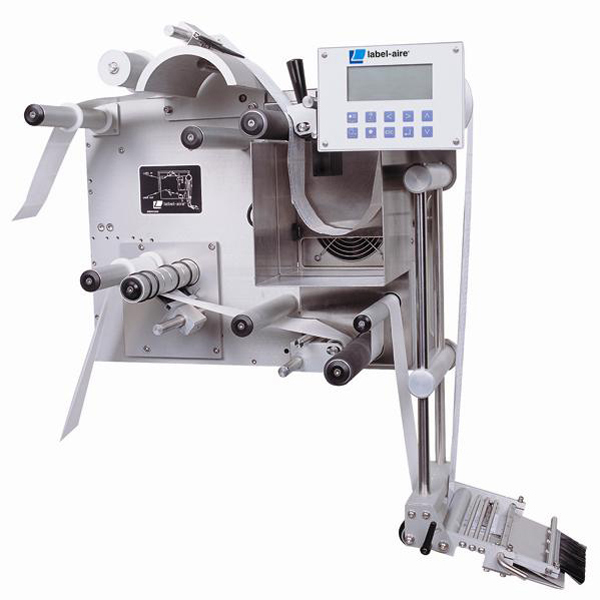 Underneath the 3015-ND is an advanced labeler that comes with many standard features making it an exceptional value. Not only can the 3015-ND be easily converted to left- or right-hand use, it can also apply labels to the top, side, or bottom of products at a dispense speed of up to 1,000" (25 m) of web per minute with a label dispense accuracy of up to +/- 1/32" (.8 mm). Put this affordable wipe-on pressure-sensitive technology to work for you all day, every day. Like every machine we make, the Model 3015-ND Wipe-On is built to Label-Aire's meticulous quality standards.